THE SCHLAGER SYSTEMS: BENGTZING ALL THE WAY! We just loved the fourth semi finale of MF 08 last night. Marty was screaming with excitement at Linda Bengtzing's Hur Svårt Kan de Va? What a stunning and energetic performance - with flashes of tartan on Linda and the dancers, come on Linda, we love you! 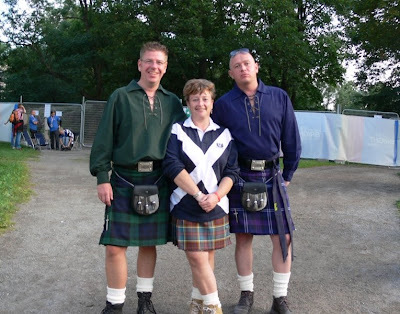 Just wait until you see the Schlager Systems at the final - kilts here we come! Charlotte's song was a little disappointing live, we were expecting explosions and glitter at the key change to mark the last key change in the contest, but sadly no! If Carola and Andreas don't get through next week in the andra chansen then Marty as said that he will never forgive Sweden for such a schlager travestly!